Key to the British Railroads planned for the British Gazetteer by John Fletcher Burrell. Esq. An antique map of England and Wales, with part of Scotland. The map is designed to show the country's railway network, and was produced by lithographic transfer for Clarke's British Gazetteer, published in 1852 by H.G. Collins. Constructed by W. Sorrell and printed by William Mackenzie, Glasgow. Printed on thin paper with many folds, some of which are strengthened on the verso with archival tape. England & Wales with Railways. 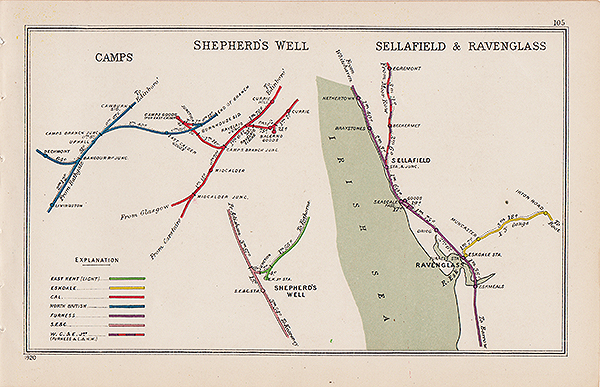 An antique map entitled "England & Wales with Railways" published in Cassells Popular Educator, in 1852. Original outline colouring. 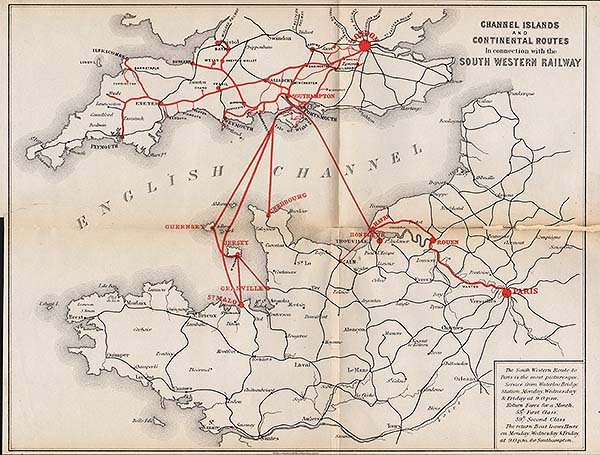 Channel Islands and Continental Routes In connection with the South Western Railway. More Info An antique railway map showing 'The South Western Route to Paris' from Waterloo Bridge Station which ran Monday, Wednesday and Friday at 9.0.pm. Has a vertical and a horrizontal folds. An antique railway map showing 'The South Western Route to Paris' from Waterloo Bridge Station which ran Monday, Wednesday and Friday at 9.0.pm. Has a vertical and a horrizontal folds. Bradshaw's Railway Manual , Shareholder's Guide and Directory 1867, S. Clarke Esq. 1867. Red morocco binding with gilt and remains of clasp. Contains numerous adverts, two fold out maps and illustrations. General wear, notably to spine. Published by (London) W.J. Adams (Manchester) Henry Blacklock in 1867. Pre Grouping railway junction around Camps, Shepherds Well, Sellafield & Ravenglass. More Info Pre-grouping Railway Junction Diagrams issued by Railway Clearing House, which was an organisation set up to manage the allocation of revenue collected by numerous pre-grouping railway companies. These companies all operated their own railway lines, but gained revenue from fares charged for passengers and goods travelling over the lines of more than one company. This was published in 1920. Pre-grouping Railway Junction Diagrams issued by Railway Clearing House, which was an organisation set up to manage the allocation of revenue collected by numerous pre-grouping railway companies. These companies all operated their own railway lines, but gained revenue from fares charged for passengers and goods travelling over the lines of more than one company. This was published in 1920. A railway map of North and Central published by Woodall, Minshall & Co, Oswestry in the Gossiping Guide. Circa 1900.